Michael Bellon has unveiled the new FlipTech Scooter he has created which is very unique in that it is equipped with a rotating deck that allows riders to carry out a variety of new and unique tricks. Watch the video below to learn more about this new scooter that has a patented rotating deck allowing riders to carry out kickflips and more. The FlipTech scooter has taken to the Kickstarter website to raise the required $50,000 to go into production and is available to early bird backers priced at $179. Its creator and developer explains more about the inspiration and design of the very unique FlipTech scooter. 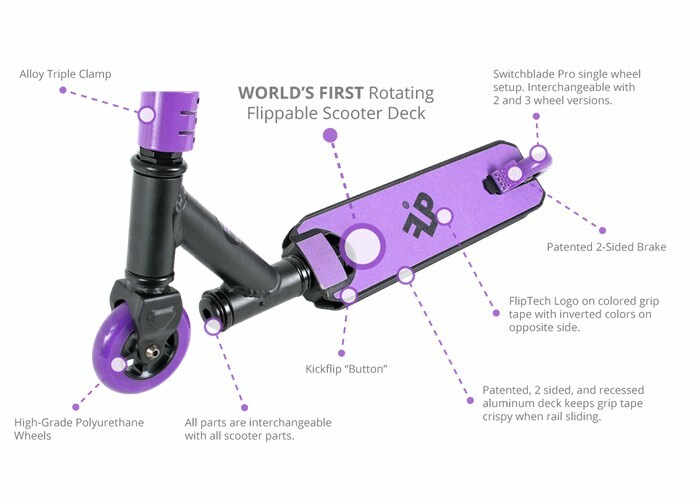 FlipTech Scooters have a patented rotating deck that allows riders to do kickflips as well as hundreds of other new tricks, catapulting the scootering sport to the next level. We are extremely excited about the opportunity to present the scooter community with the next big thing in scooters. Our goal is to bring scooters to the X-Games, and with your help we can accomplish that goal. FlipTech has partnered up with Four-Time World Champion Dakota Schuetz to help test and design our products to ensure that each FlipTech is competition ready. FlipTech was founded in 2013 by inventor and action sports enthusiast, Mike Bellon. Mike grew up skateboarding and surfing in San Diego, California. One day while skating, he had an idea to build a scooter that could do tricks just like a skateboard. Bellon went straight to the store, bought a bunch of scooters, and started cutting them up in his garage. He then sourced a U.S. manufacturer to perfect the process and start production. It was on that day that FlipTech was born. For more information on the new FlipTech scooter jump over to the Kickstarter website for details via the link below.